← Vote for Rum Bum Racing as the Team to Win! Lakeville, Conn. (25 July 2015) – With scores of home track fans on hand in support of Luis Bacardi’s Rum Bum Racing at Lime Rock Park, the team was aiming for another big result on Saturday. 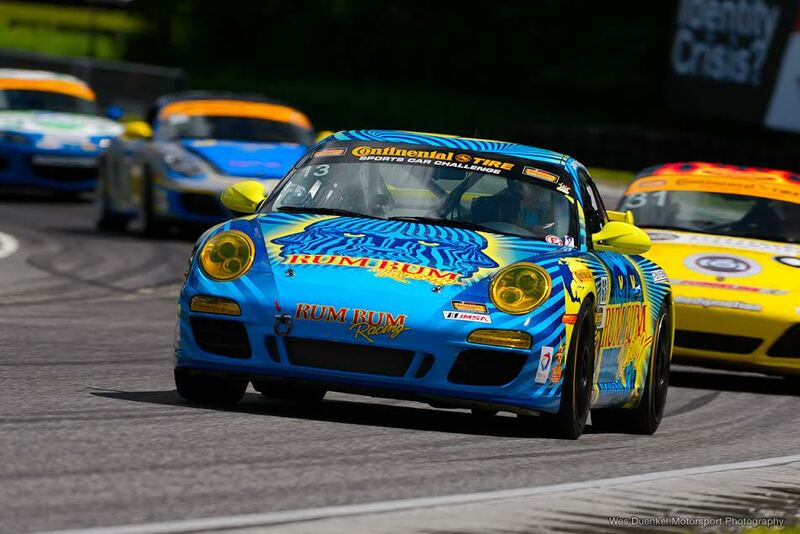 Rum Bum Racing has claimed three victories in the past four years at the track and was going for its fifth consecutive Lime Rock Park podium finish in the Northeast Grand Prix. The team looked poised to do just that until the No. 13 Rum Bum Racing Porsche was hit off track while running second. Rum Bum Racing and drivers Matt Plumb and Hugh Plumb sat second in the championship heading into Round 6 of the IMSA Continental Tire SportsCar Challenge championship and were looking to build on that at a track where the strength of the Rum Bum team shines. Hugh Plumb opened the race from second and spent nine laps leading the field when he and the No. 9 Stevenson Motorsports Camaro battled for the race lead with the third place No. 6 Camaro just behind. The run showed just how well-prepared the Rum Bum car was for the quick 1.5-mile bullring circuit when it ran the fastest lap of the race on Lap 13. As the front of the GS field encountered ST traffic through Big Bend, the line of cars checked up and the championship leading No. 6 Camaro hit the No. 13 Rum Bum Racing Porsche from behind with about 45 minutes completed in the race. The hit punted the car into the tire barriers, damaging the left front suspension which left the car undriveable. 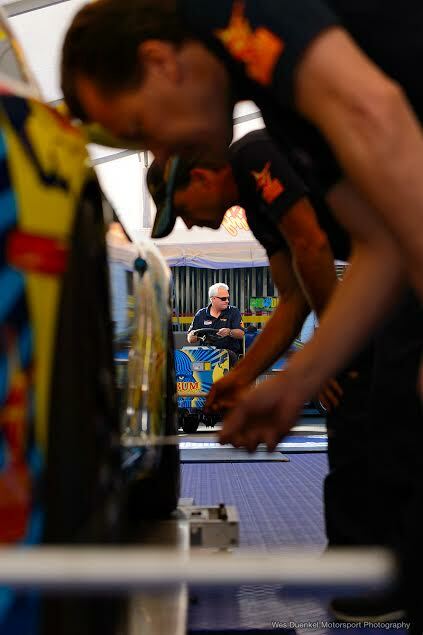 But the perseverance of the Rum Bum Racing squad was on full display as the team members hurried to make a quick repair on what typically would be a long fix. The No. 13 Rum Bum car went 17 laps down during the green flag laps that clicked off at less than a minute a lap. Matt Plumb returned the car to the track with just over an hour remaining in the race with the goal to complete as many laps as possible and pick up as many points toward the 2015 IMSA Continental Tire SportsCar Challenge championship that he could. Hugh Plumb drove the car in the final minutes of the race in order to make the minimum drive time requirement and together the Plumb brothers drove the car to a 10th place finish and salvaged some points for the championship. 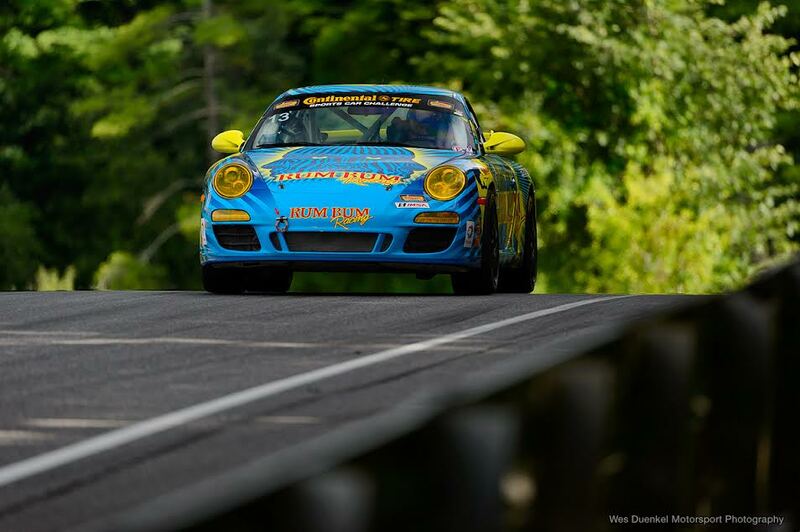 Despite the setback at Lime Rock Park, Rum Bum Racing remains second in the championship standings, 24 points back. The team next heads to Road America in two weeks for Round 7 of the IMSA Continental Tire SportsCar Challenge championship. The Northeast Grand Prix will be televised on FOX Sports 1 Sunday, August 2 at 12:00 PM ET. This entry was posted in News & Stuff and tagged bacardi, hugh, lime rock, matt, park, plumb, racing, rum bum, rumbum. Bookmark the permalink.